Tiny streams trickle down the east side of the glacier-clad peaks of the Andes, converging in a series of small rivers. As the rivers flow together, they wind across 6,516 kilometers (4,049 miles) of dense forest to form the world’s largest river, the Amazon. Approximately 219,000 cubic meters (7,740,000 cubic feet) of water—roughly the equivalent of 88 Olympic-size swimming pools—flow from the river into the Atlantic Ocean every second. As this rapid rush of water sweeps through the Amazon Rainforest, it picks up leaves, seeds, fungi, animals, and various other bits of organic matter, as well as soil and minerals and dumps it all into the equatorial Atlantic Ocean. The huge influx of nutrients has an enormous impact on life in the Atlantic Ocean. Nutrients from the plume feed microscopic, surface-dwelling, ocean plants (phytoplankton), which in turn feed a diverse population of fish. 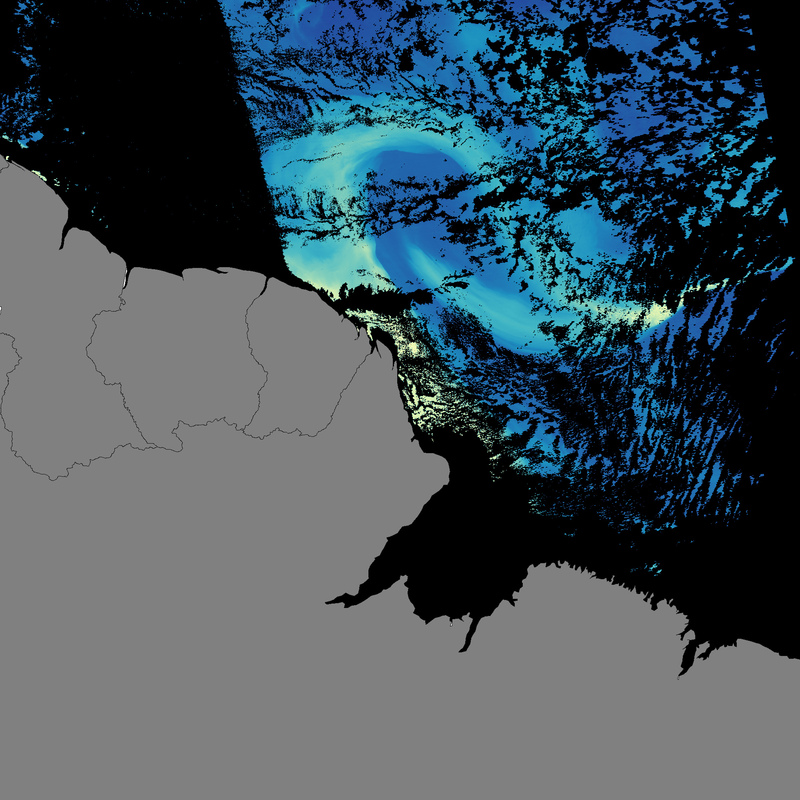 The impact of the Amazon plume is illustrated by this pair of images, made from data collected by the Moderate Resolution Imaging Spectroradiometer (MODIS) on NASA’s Aqua satellite on September 30, 2006. 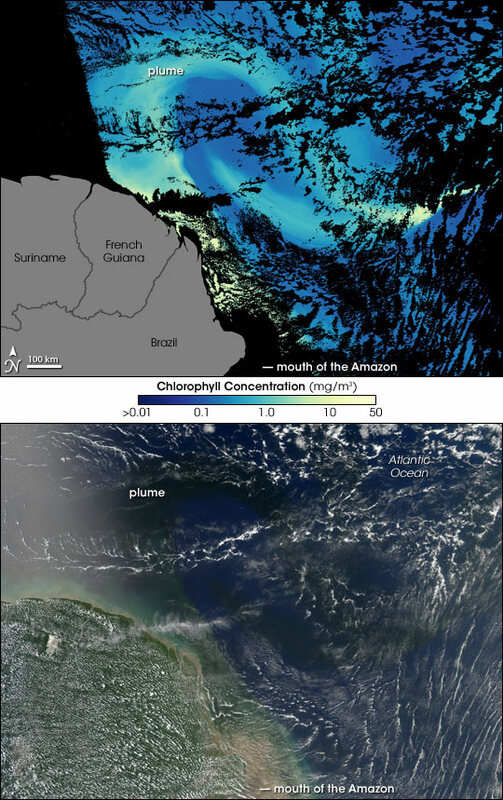 The top image shows concentrations of chlorophyll (the energy-producing pigment that give plants their green color) in the ocean surface waters. Areas where chlorophyll concentrations are highest are yellow and correspond to the plume of water pouring from the mouth of the Amazon. 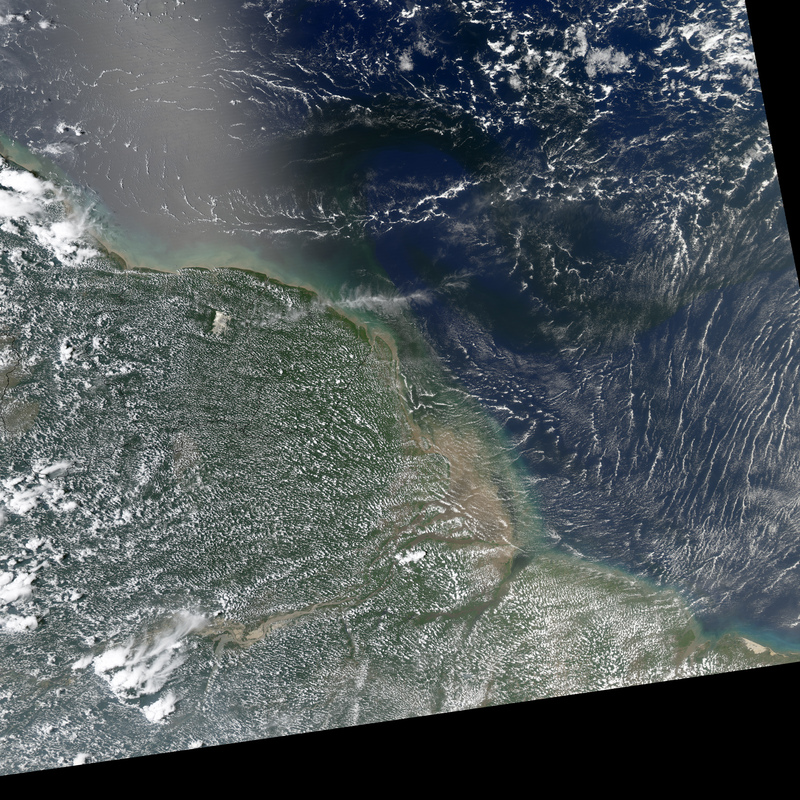 Areas that are black show where chlorophyll concentrations could not be calculated because of clouds or sunglint, the glare off the ocean water that gives the upper left corner of the photo-like image (below) a washed-out appearance. Chlorophyll concentrations are likely high in the plume for two reasons. 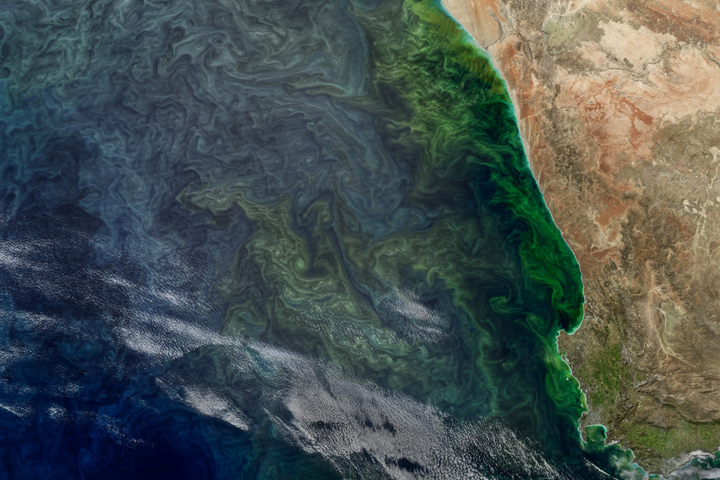 First, nutrients in the plume fertilize ocean plants, allowing them to grow more quickly near the plume. Second, the water within the plume has such a high volume and is moving so fast that it has not dispersed into the Atlantic, and plant matter from land is likely still concentrated within the plume. In fact, the Amazon plume remains concentrated enough that it can be seen meandering several kilometers across the Atlantic in the natural-color image. The plume is a band of dark water that first sweeps north on the North Brazil Current, a coastal ocean current similar to the Gulf Stream off the southeastern United States, and then snakes east in ever-fading loops on the North Equatorial Counter Current. Amazon River, an article on Wikipedia. The North Brazil Current, by Barbie Bischof, Arthur J. Mariano, and Edward H. Ryan, and published on the Ocean Surface Currents web page provided by the National Oceanographic Partnership Program. The North Equatorial Counter Current, by Barbie Bischof, Arthur J. Mariano, and Edward H. Ryan, and published on the Ocean Surface Currents Webpage provided by the National Oceanographic Partnership Program. NASA images created by Jesse Allen, Earth Observatory, using data provided courtesy of the Goddard Earth Sciences DAAC and the Ocean Color Science Team.